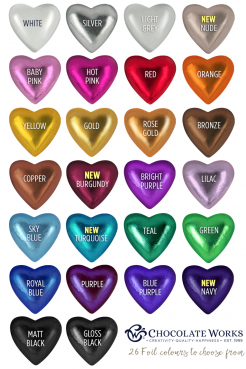 A range of coloured foils for wrapping your chocolates in. Foil Sheets for chcolate wrapping. Sheet size is 500mm x 350mm. Available in a range of 25 colours - some exclusive to Chocolate Works. Price is for 1 kilo of sheets (approx. 210 sheets). Foil swatch to view foil colours. Please note - not all foil colours are always available - see the dropdown list on your product for available colours at time of purchase.